Waterborne Coatings Market size was over USD 60 billion in 2016 and consumption should surpass 30 million tons by 2024. Global architectural coatings market is estimated to surpass USD 90 billion by 2024 due to increasing demand in residential, industrial and commercial infrastructure supported by easy financial assistance. Rapid urbanization in Asia Pacific and LATAM along with high construction spending should boost waterborne coatings demand. Stringent enforcement regulations regarding maintaining low VOC levels should drive industry growth. Waterborne paints are a class of low-VOC & HAP content product developed to reduce harmful emissions, provide hardness and demonstrate efficient weather resistance compared to latex paints which have higher VOC content. Waterborne coatings are widely applicable in wood industry for windows, furniture, cabinets, flooring and doors. Global wood paints market should surpass USD 3 billion by 2024 owing to its low odour, low VOC and formaldehyde content making it suitable for wood industry. Rising economic standards has led to increase in renovation activities with interior decorations thereby stimulating industry growth. Weak adhesive quality over marginally prepared surfaces at low temperature, requires increased working time and cost, hindering industry growth. These products do not have strong adhesive properties when applied over chalky, grimy and peeling surfaces compared to alkyds & requiring thorough surface preparation. Key raw materials for production include polyester, polyurethane, polytetrafluoroethylene, polyvinylidene chloride and fluoride. These materials have wide usage & demand in various other industries which may widen demand & supply gap thereby affecting industry price trend. Waterborne coatings industry size from architectural coatings should witness strong gains and surpass USD 85 billion at the end of 2024. Interior wall coatings occupy a major part of architectural coatings market. They are used as standard technology to help in reducing VOC content in the atmosphere. Automotive OEM applications should register gains at over 5% during foreseeable timeframe. It protects automobile from UV radiation, bad weather, acid rains and discoloration of paints. Strong automotive production rate along with growing vehicle demand in Europe and Asia Pacific region should propel industry growth. Waterborne coatings market size from metal packaging applications should witness gains at above 3%. It finds extensive application in preserving food and other edibles from pathogen. Metal packaging in food & beverage protection extends product shelf life and keeps nutrition intact complying to consumer demand which should fuel industry growth. Protective coating applications should witness steady gains owing to increasing demand to protect machineries and equipment from harsh operating & environmental conditions. Strong indicators for growth in construction, oil & gas and manufacturing sector may have positive influence on product demand. Acrylic waterborne coatings market size may exceed USD 60 billion by 2024. Key characteristics include high UV resistance, colour retention, durability, floss retention, toughness, flexibility and resistance to cracking which makes it suitable for construction, metal refinishing and protective coatings. This factor is likely to have positive influence on product demand. 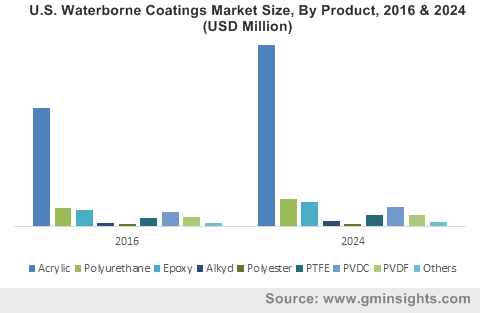 Waterborne PU coatings market size should grow at over 6% by 2024.These provide excellent balance of flexibility, abrasion resistance and hardness making it a popular choice for bonded leather, PVC and rigid plastic applications, thereby stimulating market growth. Alkyd based waterborne coatings market size should witness significant gains during the forecast timeframe. Strong R&D spending to formulate novel products along with development of advanced processing technology to produce solvent-free alkyd formulation which may contribute towards industry growth. Europe market size should observe growth at over 4% during forecast period. Strict regional employee safety & protection laws refrain using solvent based paints and promotes using bio-based coatings in automotive refinish industry. Growing automotive sales in the region should propel market growth. Germany market size should surpass USD 7.5 billion at the end of 2024. Stringent regulations to lower VoC emissions to reduce carbon footprints along with presence of automobile manufacturing units may boost product demand in the region. China market size must witness significant gains during foreseeable timeframe owing to adoption of green technologies. Strict environmental policies have led to rise in use of eco-friendly coating technologies which may favour regional industry growth. Waterborne coatings industry share is moderately fragmented with presence of key participants including BASF, Berger Paints, PPG Industries, Sherwin Williams, Valspar, Axalta, and Nippon Paint. 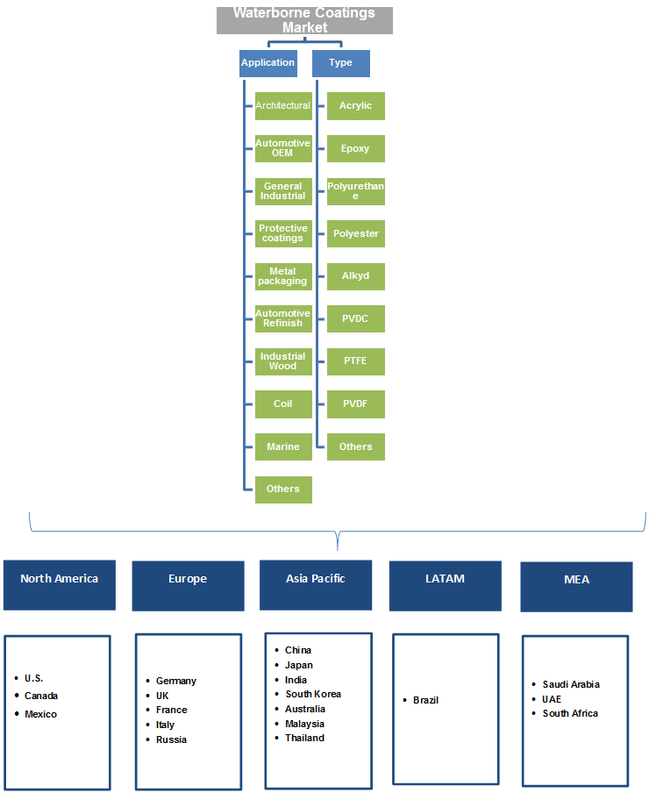 These players have adopted strategies to capacity expansion, new product development and regional expansion by mergers, acquisition and partnership. Companies are also focussing on enhancing their product portfolio and reducing production cost by adopting new production technologies. These products are green substrates which use water as solvent to dissolve resin, making it easy to apply and environmental friendly. It contains about 80% water combined with minimum quantities of other solvents like glycol ether. These products contain with minimum level of VOC & HAP content. They offer good thermoplastic properties, flexibility and stays soft coping better movements with the substrate. These paints also are highly durable with better mould & chalk resistance.